You are here: Home / Automation / How to check the size of your Config & SEAT data in the VCDB in vPostgres? After publishing my article on how to check the size of your vCenter Server's Configuration and Stats, Events, Alarm & Tasks (SEAT) data for both a Microsoft SQL Server and Oracle based database, I had received a few requests for doing the same for the vPostgres database which the vCenter Server Appliance (VCSA) uses exclusively. 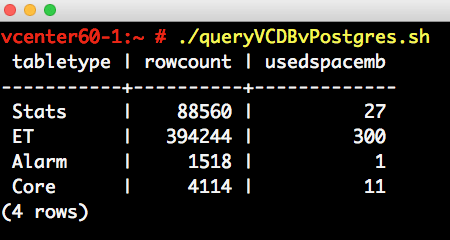 Thanks to one of our Engineers who works on the VCDB, I was able to quickly get the relevant SQL query to perform the exact same lookup as the other two databases. Since the VCSA is harden and locked down by default, being able to remotely retrieve this information will actually require some additional configuration changes to your VCSA which may or may not be acceptable. Because of this constraint, I will provide two options in how you can perform this SQL query. The first option (easy) will be running the SQL query directly from within the VCSA. You just need SSH access and no other information or credentials will be required. The second option (complex) will be to remotely connect to the vPostgres database (generally not recommend) which will require the VCDB's credentials which I will show you how to retrieve. Lastly, I want to quickly mention that in the upcoming vSphere 6.5 release, this information will be super easy to view not only from a UI but also API as shown in tweet below. Step 1 - Download the following shell script called queryVCDBvPostgres.sh which contains the respective VCDB SQL query. Step 2 - SCP the shell script to your VCSA and then login via SSH. Step 1 - Login to the VCSA using SSH. This will allow vPostgres to be connected to from any address or if you want to restrict it to a specific IP, you can also just specify that. Similiar to the previous configuration, you can either specify a network range using CIDR notation or a specific IP Address. This will open up the VCSA's firewall to allow remote connections to the vPostgres port which the default is 5432. At this point, you have now enabled remote connections to the VCSA's vPostgres DB. The next step is to retrieve the VCDB credentials which you will do so using a PowerShell script that I have written to perform the remote SQL query. This will also require that you setup an ODBC connection on your client system to communicate with the vPostgres DB. Please have a look here for more information on how to setup the ODBC connection. Step 9 - Login to VCSA via SSH and then look at the /etc/vmware-vpx/vcdb.properties and you should see the password to your VCDB. Go ahead and record this some where as you will need it in the next step. The username for the DB will be vc which you can also make a note of. Step 10 - Download the following PowerShell script called Get-VCDBUsagevPostgres.ps1 and provide the connection details that you retrieved in Step 9. If everything was properly configured, you can run the PowerShell script and it should produce a similiar output as shown in the screenshot below. That way people can monitor it including historic data in a simple way.